As I was walking along the beach one cool spring morning, I stumbled upon an old bottle sticking out of the sand. The glass, once clear, looked cloudy with a sickly green tint to it. I picked it up, curious as I am about strange artifacts. There was something inside, obscured by the grimy exterior. I pried the cork off the bottle and dropped it in surprise as smoke issued forth from it. As I backed away from the billowing smoke, it formed itself into a vaguely human form. I didn’t respond right away. Several seconds went by as I blinked and tried to convince myself this was just a hallucination. But the smoke genie persisted. I thought I could detect a little impatience in the way it billowed. I scratched at my scruffy beard, still trying to determine if what I was looking at was real. Again, I didn’t respond right away. Only one wish to get whatever I wanted? That was tricky. What did I want? A better job would always be nice. Maybe just a ton of money without the job. A girlfriend. Maybe a wife? No, that’d be weird without the girlfriend part first. Peace on Earth? To be honest, that’s a bit broad, and would that really help me? Not to sound selfish, but it was my wish, after all. I hated having to think about big decisions like that. They always made me nervous, which just made me stressed. Any moment now, the panic attacks would start, and…wait, I knew just what I wanted. That was disappointing. What made me happy? There were all sorts of little things. Books and adventure films and good conversations. Chocolate chip cookies and dogs and the laughter of loved ones. But was that ‘happiness’? I didn’t know. I had no idea. What could make me truly, eternally happy was a mystery, as obscure and hard to define as the smoky spectre that floated in front of me. I amended my wish and set the genie free. It was surprised. As it granted my wish, the smoke took on a more definite shape. An old man stood in front of me now, his face heavily lined, several eons of life etched onto it. The lines deepened as he broke into a smile. He thanked me for freeing him and walked away. He stopped for a few moments to admire the scenery around him, the pale sand strewn on the beach, the waves lazily approaching the shore before retreating. With a contented sigh, he kept walking until he disappeared into the horizon. After a few moments, I resumed walking as well, feeling as empty as the bottle that lay half buried in the sand. I’ve always fit the definition of what you might call a ‘nerd’. Math and the sciences were among my favorite subjects in high school, I was basically a teacher’s pet in my English classes, and it was probably easier to teach a fish to tap dance than to teach me any sort of sporting activity. It didn’t help that my older brother was a bit of a sports superstar, something various relatives never hesitated to remind me of, and which only pushed me further away from the ballpark. I’d much rather have my nose buried in a book. Like any kid, I loved me my cartoons. Adulthood has done little to change my opinion of them, even if the spooky mysteries of Scooby Doo are laughable for the wrong reasons now. At some point, I discovered the world of comic books. I’m not entirely sure what led me down that path, but there I was. They were fun to read and a good way to pass the time; I never expected them to become a lifelong hobby. As a child, I remember walking into my brother’s room as he and his friends were watching Batman (the Tim Burton film). It was near the climax, and I just remember this eerie looking guy in a black bat mask and outfit fighting a purple-suited clown. I was hooked right away. That image remained mostly forgotten until Batman Returns came out, and I was intrigued to find out more about this ‘Batman’ guy. He seemed quite alright. My childhood love of fairy tales (I never got tired of reading Jack and the Beanstalk) instilled in me a lifelong love of the fantastical and the surreal, and set me on the path to being a sci-fi and fantasy junkie. I was glued to the TV on many an afternoon watching Star Trek and Lost in Space, and though I haven’t watched Star Wars (what?! ), I’m very familiar with Star Wars trivia, almost as much as any diehard fan. These were the foundations of my formative years. But, as I discovered growing up, such pursuits were looked down upon by the cool kids. Science fiction, fantasy, comic books. These were the domain of nerds and geeks, the weirdos that nobody invites to parties. Nobody wants to be a pariah, so I downplayed my interests to try and fit in. During early adulthood, I let the mask slip a bit, letting people know my interests, but I still kept it quite low-key. However, I think it’s time to accept who I am now, Earlier this year, I attended my very first comic convention, the Middle East Comic Con 2015, and I was thrilled! It’s the kind of thing I would have shied away from in the past for seeming too nerdy, but it’s time to let that banner fly proudly. I’m no longer in the business of trying to impress people by putting on a ‘respectable’ front. Yep. 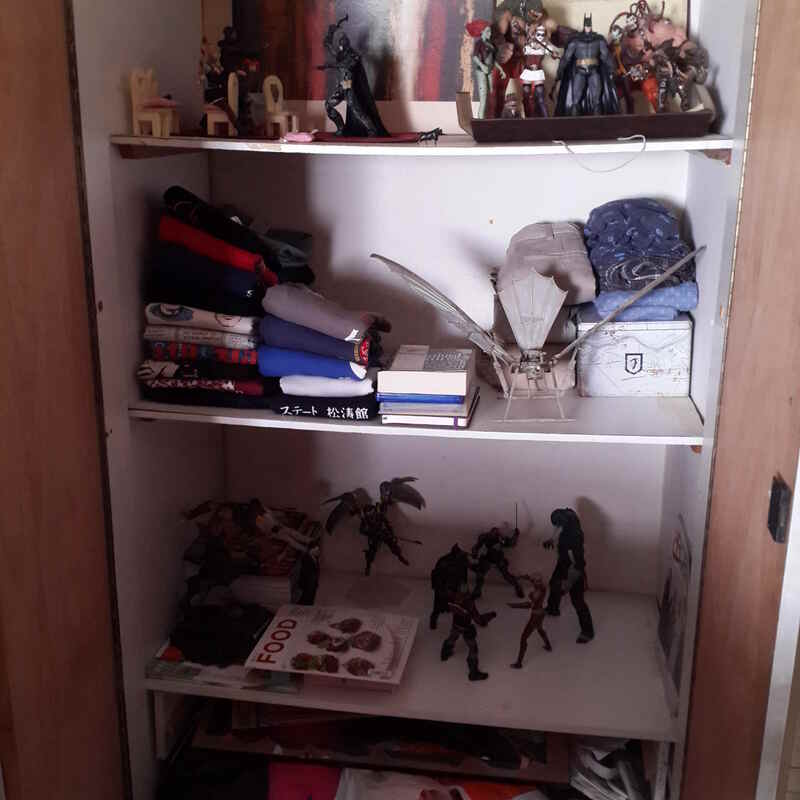 About three quarters of a shelf dedicated to clothes, and the rest for my assorted action figures and memorabilia. There are a few bookshelves around the house that are also guarded by my toys. I’ve got a long list of video games I intend to play this year (such as Arkham Knight, coming out Tuesday! ), and there are many more collectibles that will take up more space than I can hope to provide right now.